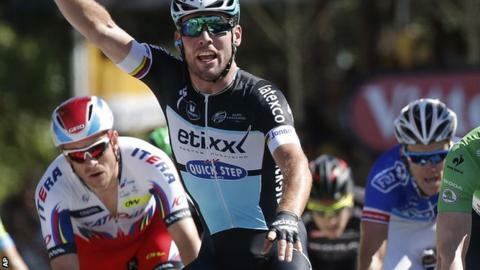 British cyclist Mark Cavendish has joined MTN-Qhubeka after three years racing for Etixx-Quick-Step (EQS). The 2011 world road champion, 30, has joined the South African team, who will be known as Team Dimension Data from next year. A 26-time Tour de France stage winner, Cavendish brings Australian Mark Renshaw, 32, with him from EQS. Austrian former HTC-Highroad and Team Sky team-mate Bernie Eisel, 34, also joins. "It's fair to say that most of the peloton has seen how incredible the team raced this year," said Cavendish, who added the riding for a "greater cause in the Qhubeka charity" was "one of the biggest incentives". Team owner Douglas Ryder described signing Cavendish as a "huge step forward" for the team towards reaching the "next level in world cycling". Talks are ongoing with EQS for sporting directors Rolf Aldag and Brian Holm, who also worked with Cavendish, Eisel and Renshaw during their successful spell at HTC to also make the move. A secondary sponsorship deal with Deloitte has been confirmed and will help cover Cavendish's wages. The Manxman has had a successful season, with a stage win in this year's Tour de France and the Belgian one-dayer Kuurne-Brussels- Kuurne among 13 victories. He had shoulder surgery after being injured during the Tour of Britain earlier this month. In 2016, he is aiming to compete for Great Britain on the track at the Rio Olympics. It will be his third Games but he has never won a medal. As sporting cliches go "the worst-kept secret" is up there with games of two halves, sleeping giants and sick parrots, but Mark Cavendish's move has been so well signposted nobody has even pretended it was a secret. That will not stop some fans wondering why the man who is still one of the sport's most prolific winners is leaving a big-budget team from cycling's heartlands for an upstart outfit from South Africa. There is no simple answer, but Cavendish has not quite delivered the headlines EQS hoped for when they signed him in 2012, there was alarm at his desire to go for a track medal at next year's Olympics and there is a growing sense that Team Dimension Data are upstarts no more. The team that rode so well at this year's Tour de France and Vuelta as MTN-Qhubeka have always combined their mission to promote cycling in Africa with the more prosaic business of winning races, gaining column inches and pleasing sponsors. Cavendish and the team of HTC-Highroad veterans he brings with him, should continue to deliver those for at least a few more years.